Hydrogen is often characterized as the "ultimate fuel of the future," being both clean and available without the need for energy imports. Hydrogen is important to Manitoba as a future opportunity. Manitoba has a natural advantage for the production of clean hydrogen using the province's abundant hydroelectric resources. With the lowest electricity prices in North America, Manitoba will be the first jurisdiction on the continent where hydrogen could be produced economically via electrolysis. Using hydrogen will require a variety of new technologies, products and services, such as fuel cell buses and hydrogen refueling stations. This also means economic opportunities for Manitoba companies and new high-technology jobs. Manitoba has developed a hydrogen vision to position the province for the future, and has begun the process to develop a Hydrogen Economic Development Strategy. 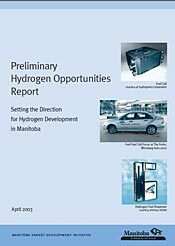 As the first logical step, a series of broad-based preliminary assessments were conducted by Working Groups under the auspices of the Manitoba Hydrogen Steering Committee to identify appropriate hydrogen-related opportunities for the province as a whole. This work was coordinated through the Energy Development Initiative, but it reflects the cooperation of many participating organizations, including different departments, all three levels of government, utility, university, and industry representatives.